When it comes to trying out new skincare products I am usually pretty hesitant. I've always had relatively good skin but college and the stress that comes with it makes it act out more so than it did in high school. I always love seeing what other people use but am slow to switch up my routine when it comes to trying different products. When seasons begin to change is when I am most likely to switch things up since it is likely that my skin needs something different progressing from winter to spring. 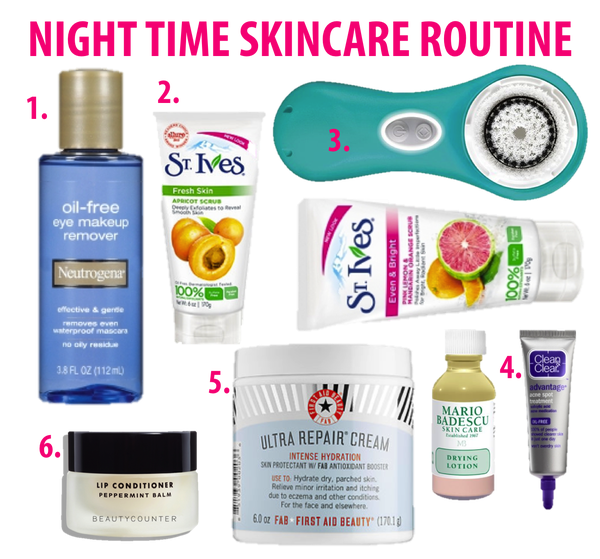 I thought that it could be fun for me to share my typical night time skincare with y'all with hopes that you'll recommend some other products for me to try out! 1. I start by removing my eye makeup using this Neutrogena Eye Makeup remover. I use it with cotton rounds and prefer to do it before showering instead of after since I like to have all of the product washed off of my face. If I am traveling and don't want to travel with this bottle of liquid I also really like their wipes! 2. I shower at night so that is where I tend to wash my face. I start by using this St.Ives Apricot Exfoliating Scrub. Nothing special here, I just rub it between my hands and scrub it onto my face and then rinse! 3. Next I use my Clarisonic Mia with a bit St. Ives Even and Bright Face Wash on it. I have had my Clarisonic for a few years now and really love it! 4. Since my face does break out on occasion I like to have spot treatments on hand for when I need them. I have had multiple tubes of Clean and Clears Spot Treatment and like dabbing that onto problem areas of my face. The other option that I like that tends to work well is Mario Badescu's Drying Lotion. This one I use a q-tip to apply and then you leave a little pink spot on top of any blemishes that you want to dry out. This really helps any problem spots to disappear a bit quicker and one little container of it lasts a long time! 5. In the winter especially it is super important for me to remember to moisturize. On occasion I get these weird stress rashes on my legs and arms (glamorous, I know) and this First Aid Beauty Hydration Lotionis the best lotion I have found for that so far and it is also great to use on your face. It is incredibly moisturizing and perfect for sensitive skin. 6. Lastly I like to apply a bit of chapstick before bed to moisturize my lips. My favorite since this summer has been this Beauty Counter Lip Conditioner in peppermint. It leaves my lips feeling super soft and tastes good too! Thanks for the tips. I love St. Ives scrub. I like CeraVe products.